Economic islands are single regions or groups of regions in the NEM that are economically separated. This occurs when inter-connectors are constrained, causing the price for the islanded region(s) to be set by a generator within the islanded region(s). Economic islands are shown by a red outline around the regions that are economically joined. There are three economic islands in the above image: QLD, NSW+VIC+SA, and TAS. The islands are created because QNI and Basslink are constrained. It is clear that price separation between islands is occurring. The price in QLD is $24.97, NSW+VIC+SA is about $40 and TAS is $1.26. 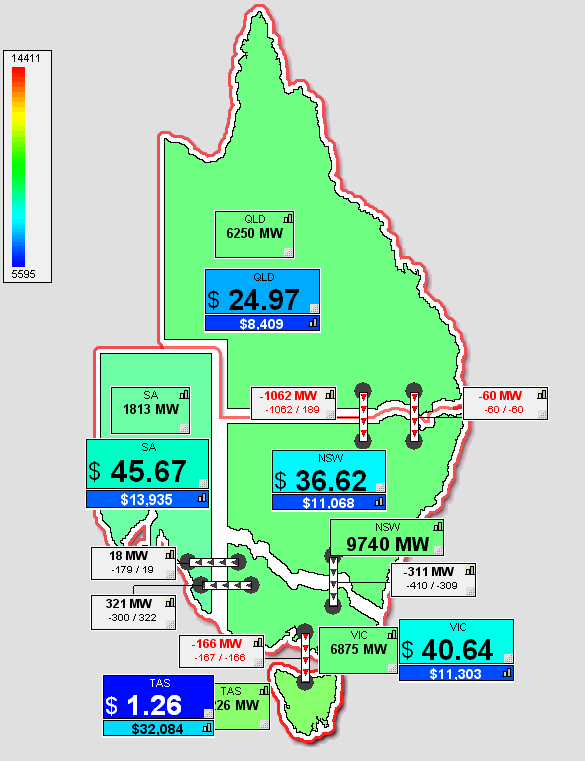 This is because a generator in QLD is setting the price for QLD, a generator in NSW or VIC or SA is setting the price for those regions and a generator in TAS is setting the price for TAS.